If you dream of one day using an iOS-powered MacBook, we have good news and bad news. The bad news is Apple is never going to make a laptop powered by iOS. But the good news is if you have an iPad Pro, one simple discounted accessory will give you an iOS laptop experience today. 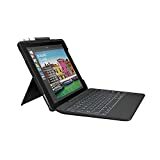 The Logitech iPad Pro 10.5 inch Slim Combo Keyboard Case slaps a great backlit keyboard onto your iPad and it folds open like any normal laptop. Then there’s a back portion that has a built-in kickstand so you can stand up the screen while you type. It’s awesome, and it’s on sale right now at a discount so grab one while you can.